Stories were shared, gray photos were identified, cake was eaten and God was worshiped. 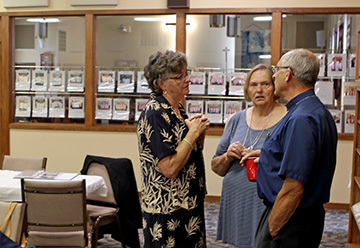 North Bend Lutherans past and present congregated Sunday to celebrate the 75th anniversary of St. Peter Lutheran Church in North Bend. The Rev. Calvin L'Heureux and his wife Erma, left, talk with Martha Settles at the afternoon reception at St. Peter. Pictures of nearly every confirmation class were displayed in the windows. The day started off with a packed house attending worship services at 10:30, followed by a more informal reception in the afternoon where stories and the history of the church were shared. Fresh out of seminary, Wonnacott was the pastor at St. Peter from 1982 to 1985. Now a hospital chaplain in Norfolk, he returned Sunday to help lead the church service along with Rev. Calvin L’Heureux and partake in the festivities. At the afternoon get-together, Jim Spath shared some of the historical research he has been doing on the church, while church secretary Diane Larson shared historical pictures on the projector. While it has been 75 years since St. Peter was officially organized – 11 men signed the church constitution on Jan. 3, 1943 – the Lutheran presence in North Bend goes back much further. As early as 1894 families met in homes for church services under the guidance of ministers from in nearby towns. In 1931 a Dodge-North Bend parish was established with the Dodge pastor. That was followed by a partnership with the Schuyler church starting in 1935. Services were still conducted in private homes until a deal was struck in 1939 to rent the Christian Church at Ninth and Catalpa streets. Dave Saalfeld, who was confirmed into St. Peter’s Church in 1965, remembers seeing Feyerherm preach when the pastor returned as a guest preacher years later. In the early ‘40s relations between the Lutherans and their hosts from the Christian Church began to sour. The Christian congregation was shrinking and the rumors were the Christians felt the Lutherans were stealing members from them. Rent for the Lutheran use of the church building was tripled and they were told they had to be out of the building by 9:30 a.m.
By May 1944, the St. Peter’s Lutherans – whom had voted to join the Missouri Synod – were looking for a new home. A committee was established and tasked with securing St. Peter’s its own church building, though some members thought the congregation should wait until World War II and the rationing that went with it was over before tackling the task. In the mean time, the fledgling church met in the basement of the city library then the Sellhorn Funeral Home. The building committee bought two lots from the undertaker H.H. Sellhorn at 10th and Maple streets, but because of war rationing, building materials were hard to come by. So the committee purchased Dry Creek Catholic Church, a parish that had closed north of Schuyler. The 24-by-40 foot structure was purchased for $350 at auction, half of what the congregation had budgeted. No one could be found to move the building, so church members themselves took on the task, removing the Dry Creek church’s steeple to fit under power lines.